To many Americans, Cinco de Mayo is a drinking holiday, an excuse to imbibe tequila shots, drink Corona and Dos Equis beers, and maybe wear a sombrero if you get tipsy enough. But for people of ethnic Mexican descent, the 5th day of May is a day to celebrate cultural resilience and victory over colonialism (the date denotes the anniversary of the defeat of the French army at the battle of Puebla, not Mexican Independence Day, which its often mistaken for). This past May 5th marked the grand opening of La Cultura Cura Cultural Arts café, a new economic and cultural initiative of Communities United for Restorative Youth Justice (CURYJ), a non-profit organization dedicated to disrupting cycles of violence and poverty which impact youth by taking a restorative justice approach. The event was also an official celebration marking the repeal of Oakland’s gang injunctions, the issue CURYJ originally organized around back in 2011. Many of the defendants placed under gang injunction by the Oakland City Attorney’s office in the highly-publicized, now-abandoned effort now work with CURYJ, who raised $15,000 with a successful kickstarter campaign to open the café, situated next door to East Side Arts Alliance in the San Antonio district. 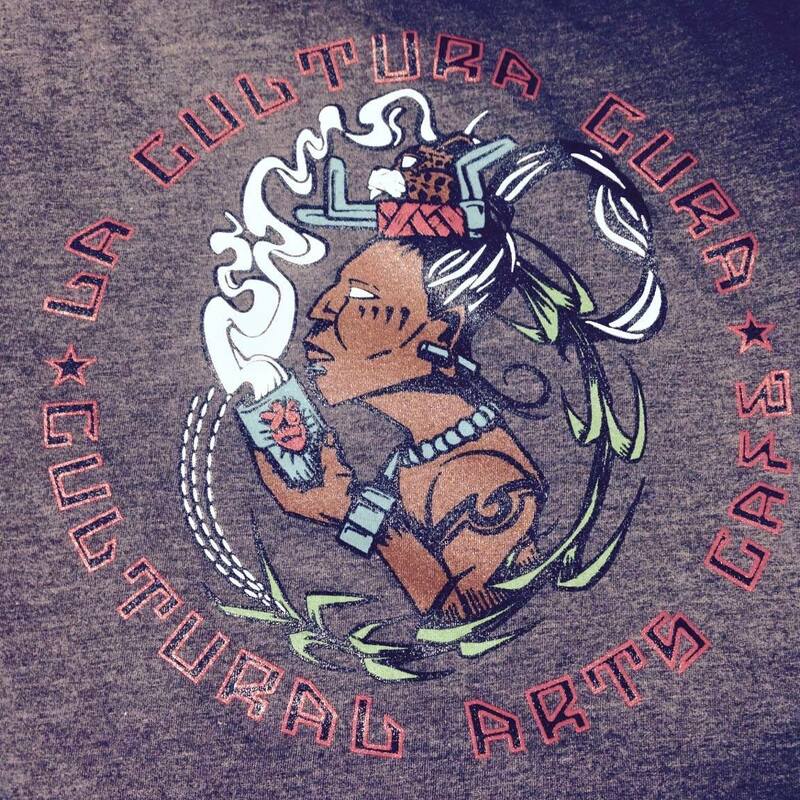 In addition to employing youth—including those formerly incarcerated—La Cultura Cura claims to be empowering communities, promoting positive economic development and offering an alternative to gentrification by reopening indigenous trade routes; their free trade organic coffee is reportedly grown by Zapatista Mayan descendants in the state of Chiapas. The café’s grand opening event was a joyous occasion, featuring a full performance by Aztec dancers in full regalia on the sidewalk and street in front of the café. It was a little surreal to see the juxtaposition of the Aztecs in their colorful traditional garb against a backdrop of cars and AC transit buses, symbolizing the dichotomy between modern civilization and ritual culture. The traffic flowed in both directions, marking a type of unintended urban dance which contrasted the purposeful movements of the native dancers – who sought to bless the space by honoring the ancestors. Inside the café, every wall was decorated with political art posters by Dignidad Rebelde’s Melanie Cervantes and Jesus Barraza, which spoke to the cultural resistance of Hispanic and Chicano peoples, as well as their solidarity with other liberation struggles – Steven Biko and Angela Davis were among those featured, along with Zapatista women, Arizona immigration activists, and musicians depicted with accordions or guitars. Tamales la Oaxaquena served yummy plates of rice, beans, salsa and cooked chicken, washed down with mint-infused ice water. A full house of community members, many of them parents with young children, attended, and there were live performances from local hip-hop artists as well as a short speech by CURYJ’s George Galvis. It was an auspicious opening for a much-needed space in one of Oakland’s most ethnically-diverse districts, one facing increasing encroachment from the forces of gentrification. Dignidad Rebelde’s exhibit, “La Cultura Cura,” runs until June 30th, at 2289 Int’l Ave., Oakland. 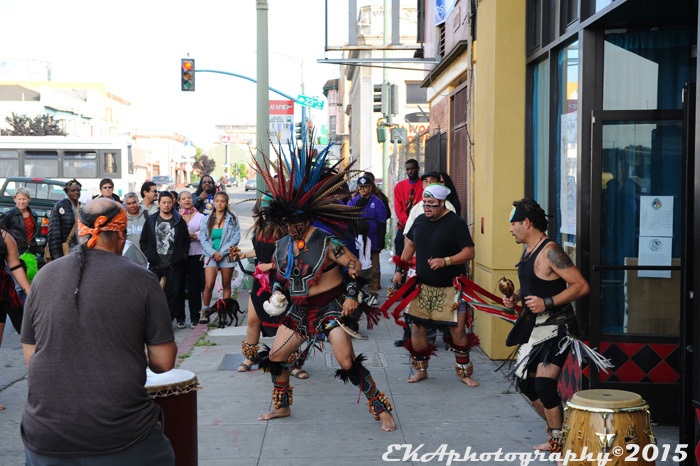 Categories: Cinco de Mayo 2015, Event review | Tags: Aztec dancers, Chiapas, CURYJ, Dignidad Rebelde, free trade, indigenous culture, Jesus Barraza, Melanie Cervantes, new restaurants, Oakland, political poster art, San Antonio | Permalink.